Daniel Foster | Mon, April 30, 2007 | Misc. Today’s post is written by Scott Lindsey, director of ministry relations for Logos, who is on the Bible Study Bus road trip. View more road trip photos at Flickr. Right after Easter service on April 8th, I took off with my family to begin the 2007 Bible Study Road Trip. Our first event was in the Gresham, OR area at Good Shepherd Community Church. We had a great turnout. 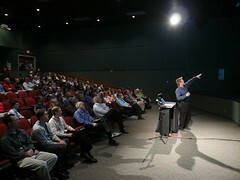 Those who attended were shocked to see what Logos has been doing for the last 16 years. The goal of this year’s Bible Study Road Trip is to introduce congregations to the potential of using the Logos technology for Bible study. We are honored to have American Family Radio sponsoring this year’s tour. American Family Radio is one of the largest Christian radio networks in the country and they will be promoting a majority of the events in the cities where they have radio coverage. For the past 2 weeks we have been trying to get to the AFR listenership areas as fast as we can…3,000 miles in 14 days! In has been an amazing journey with my wife and children seeing this awesome nation we have the privilege of living in. We have made stops in Oregon, California, Arizona, New Mexico, and now Texas. We will be in great state of Texas for the next few weeks. The children had a great home school learning experience this past Saturday night in Amarillo when we all spent 4 hours in a RV park storm shelter while 11 tornados dropped all around the city! My wife loves the Pacific Northwest even more now! On the way down to Lubbock for our April 23rd event, we stopped through the small town of Tulia, TX where one of the bigger tornados touched down. 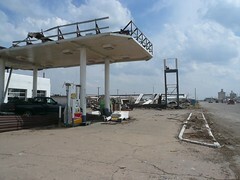 The tornado completely destroyed a Ford dealership, grocery store, and gas station (see the news story).We took some amazing pictures and were glad to find out no one was seriously injured. My children pay a bit more attention now to Texas storm clouds! We are currently in Abilene, Texas. I was stationed here at Dyess Air Force Base over 10 years ago and we still have great friends here. It has been a wonderful few days of fellowship. We are on the way to San Antonio this weekend. 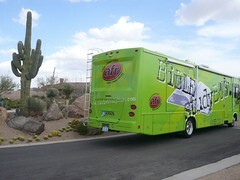 If you would like more information about the Bible Study Road Trip and where we are going, please visit www.BibleStudyBus.com. We would love to see you at one of the events! Daniel Foster | Fri, April 27, 2007 | Misc. It used to be thatprisoners would roll an inexpensive cigarettefrom a pageout of theBible, but no longer.According to a report fromCrosswalk.com, smokers half a world away are driving up the cost of the special paper used to print Bibles. Religion Today Summaries, April 26, 2007—There are at least two good reasons to stop smoking. Number one: It may damage your health. Number two: It raises the production costs for Bibles, ASSIST News Service reports. The Chinese craving for cigarettes is responsible for rising paper costs in bible printing, according to the business manager of the German Bible Society, Felix Breidenstein. Because of the rising demand for cigarette paper in China the special thin paper used in bible printing is getting more expensive, as Breidenstein told the German news magazine Der Spiegel. The German Bible Society sells approximately 400,000 bibles per year. I’ve always been intrigued by how our experience of the Bible is affected by the medium, which in turn is constrained by logistical factors such as the cost of paper. The Bible has a lot of pages and yet it’s a book we carry around with us more than most other books. That means we want it to be thin and light, not big and bulky.Hence special, super-thin paper, small print, two- or three-column layout, and relatively narrow margins. All of these factors impact our interaction with the Bible in subtle or not-so subtle ways. Example: Thin pages => special no-bleed marking pens =>crocheted Bible cover with pockets to hold pens. It’s a slippery slope. Of course, the experience of using an electronic Bible is similarly influenced by the library software used to read and search it. How cross-references or footnotes are handled, how poetry is formatted, options for notes and highlighting—all these and more contribute to the user experience, and all are subject to various constraints. The difference is, electronic Bible publishers fret about CPU, RAM, and screen size while print Bible publishers lie awake at night worrying about how many Chinese are taking up smoking. Update 4/27 – Smoking Bible pages actually does happen, as attested by a Bible Network News audio report about a prisoner whose chaplain asked him not to smoke the book of John. Click here to open the BNN page, then scroll down to “Texan smoked Bible passages”. Daniel Foster | Thu, April 26, 2007 | Misc. Searching works! Logos Bible Software for the Mac is continuing to progress, and the latest drop has searching up and running. The screenshot also shows My Library and the Bibliography report. For a closer look, choose the medium(900px) or large(1600px) version. Daniel Foster | Wed, April 25, 2007 | Misc. Logos user and seminarianPatrick McCullough is Looking for more Anabaptists on Libronix Software. Patrick includes a great list of links to theological titles from the Lutheran tradition already available for Logos, then goes on to offer a big list of Anabaptist titles and author she’d like to see in his digital library. As I’ve mentioned before, we’re always eager to receive customer suggestions so keep them coming! New Logos user Heavy Dluxe tells the story of his 11-month search for the right Bible software and how he chose Logos Bible Software. It looks like he’ll be writing a series of posts that would be helpful to anyone doing their pre-purchase homework. One of the fun things about the world of blogs is getting to “eavesdrop” on conversations people are having with their family and friends (and random readers who drop by). Logos Bible Software: Making Bible students giddy since 1991. Another blogger who is a self-described Bible study geek says she cried (tears of mourning, not joy) when Libronix DLS replaced the old Logos Library System back in 2001. But Logos 3, released in May 2006, has made her a happy Bible study geek again. We always appreciate comments and links; we’ve said it before and will say it again: our customers are the best and we’re privileged to serve you. With 130+ employees and 5 years in Bellingham, Logos has become a big enough fish in a relatively small pond that I now hear something like this pretty regularly when I meet someone new. This past weekend, I was at a birthday party for my wife’s good friend. My wife’s friend’s dad (let’s call him Bill) heard I worked for Logos and jumped right into a discussion of translation philosophies, the benefit of studying the New Testament in Greek, and the rendering into English of a number of his favorite passages. It was a fun conversation, but, man, was I ever pining for my Logos Bible Software. Bill wanted to make a distinction here that the man’s faith was instrumental in his salvation, not his healing. I hadn’t studied the passage in enough depth to have an opinion…but the cool thing is that Logos Bible Software makes it very easy to dig in and explore a question like this. A great place to begin is with the ESV English-Greek Reverse Interlinear of the New Testament. A quick glance shows me that there are actually three different Greek words used in this passage to describe what happened to the lepers. In verse 15, Luke writes that the Samaritan sees that he is healed (ἰάομαι). To give myself some visual markers, I grabbed the highlighter tool from the main Logos toolbar and applied a different color for each of the three words I was interested in studying (click the image above for a closer look). To very quickly find out how the ESV translates each of these words across the New Testament, use either Speed Search or Englishman’s Concordance (both available from the right-click menu). Bible Word Study report gives you visualizations that make it easy to see translation frequencies at a glance. Because of the syntactically tagged resources in Logos 3, it also shows syntactical patterns. For example, your faith is the most common subject of clauses where σῴζω (rescue, save, heal) is the verb. Daniel Foster | Fri, April 20, 2007 | Misc. Today marks the 7th Annual Logos Curry Cook-Off! The very first Logos Curry Cook-Off occurred in early April, 2001, with Rick Brannan taking top honors and Eli Evans coming in a close second. I just dug back into my email folder and found a link to photos from the First-Ever Logos Curry Contest at Rick’s website. Seems like ancient history. Curry is Cooking!In the first English cookbook, published in 1390, the word cury denotes cooking. Three pounds of veal my darling girl prepares,And chops it nicely into little squares; Five onions next prures the little minx (The biggest are the best, her Samiwel thinks), And Epping butter nearly half a pound, And stews them in a pan until they’re brown’d. What’s next my dexterous little girl will do? She pops the meat into the savoury stew, With curry-powder table-spoonfuls three, And milk a pint (the richest that may be), And, when the dish has stewed for half an hour, A lemon’s ready juice she’ll o’er it pour. Then, bless her! Then she gives the luscious pot A very gentle boil – and serves quite hot. PS – Beef, mutton, rabbit, if you wish, Lobsters, or prawns, or any kind fish,Are fit to make a CURRY. ‘Tis, when done, A dish for Emperors to feed upon. Daniel Foster | Thu, April 19, 2007 | Misc. Two new Logos-related blogs were launched recently. I believe in blogging, and I want to do it well. Especially the raw, open blogging that makes some organizations transparent and approachable. So be sure to check out Bob’s new blog and subscribe. Original Expression is a new blog started by Bill Nienhuis, director of publisher relations at Logos. Billtravels a lot to meet with publishers and negotiate licenses for new books. His blog’s byline is “Book publishing, ePublishing, and everything in between.” Recent posts have focused on his time at the London Book Fair. Rick Brannan, an information architect in our design and editorial department, is still going strong with Ricoblog and also runs and posts regularly to the PastoralEpistles blog. Rick blogsa lot about the Greek New Testament, from text critical matters to orthography, from exegetical questions to the latest book he’s reading. Here are links to various “personal blogs” from Logos employees. Additionalinfo about RSS feeds (e.g., what are they and how do I use them?) and links to Logos feeds can be found at the Logos and RSS page. Bob Pritchett, president and CEOFireSomeoneToday– Subscribe! BobPritchett.com – Subscribe! Rick Brannan, design and editorialRicoblog– Subscribe! PastoralEpistles.com– Subscribe! Bill Nienhuis, director, publisher relations officeOriginalExpression – Subscribe! Daniel Foster | Wed, April 18, 2007 | Misc. It looks like Amazon.com is doing an experiment in social tagging. UnSpun beta allows users to create lists of anything they want, associate links with each item, then open up the list to the community of Internet users to rank and comment. One of the most popular lists at UnSpun right nowis titled Best Blogs about Biblical Studies. It lists 65 blogs that deal with biblical studies issues. It’s worth visiting as you will probably find some new blogs or sites to check out. The way their ranking system works is that visitors can “vote” for items on the list by clicking the up or down arrows as shown below (see the “click” pointer). If you click the Your Ranking link and sign in, you can create your own ranking of some or all of the items in the original list. Just click the left-pointing arrow to move items to your list (as shown below). This impacts their spot in the Community Ranking even more than the simple up or down vote. Check it out and show your support for the LogosBlog if you are so inclined. Daniel Foster | Tue, April 17, 2007 | Misc. Last Friday, Ken Smith, general manager of electronic publishing services at Logos and author of a number of blog posts, conceived of an idea for a new Muppets movie: The Muppets inMiddle-Earth. That’s right, a muppet cast for Tolkien’s Lord of the Rings! When somebody throws down the gauntlet like that, what can you do but rise to the challenge? A number of people did so, resultingin the following consensus cast list for The Muppets in Middle-Earth (with comments from Ken Smith). Feel free to leave your own nominations, cheers or jeers in the comments section! Aside from the hobbits listed above, all the other hobbits would have to be those aliens from Sesame Street that just walked around saying “yip-yip-yip-yip yuuuuuup“. Last Thursday’s post explained how to view all the papyri fromComfort & Barrett’s Text of the Earliest New Testament Greek Manuscriptsthat contain the verse or passage you’re studying. We set up the Compare Parallel Bible Versions report to scroll synchronously with Exegetical Guide (or any Bible or other canonically-organized resource or report for that matter) to make it easy to consult the papyri as you study. Today I want to briefly offer an alternative way to view themanuscripts related to your passage and that is the Passage in All Versions report. Passage in All Versions does not visually highlight the differences between the manuscripts but it does retain formatting such as brackets and uncertainty dots. Click Tools | Bible Comparison | Passage in All Versions. In the report window, click the Properties button. Set language to Greek and check the boxes next tothe Greek texts and manuscripts you want to appear in the report (or Check All and then clear the boxes next to the items you don’t want). Now you can enter a passage, click the Go arrow and see eclectic texts, received texts, and manuscripts for that passage. You can also use the “chain link” icon to link this report with other reports or resources so they move synchronously. Compare Parallel Bible Versions and Passage In All Versions…two options for viewing manuscripts alongside the GNT text. Update 4-16-07—a bug in the Passage In All Versions report causes some versions that you’ve deselected to appear in the report. Libronix DLS 3.0d (available as a beta download) fixes this bug.